Beneficiaries participating in an integrated rice-agriculture training in Sierra Leone. Photo by Monica Pasqualino. When WorldFish began working in Sierra Leone on the USAID Feed the Future project in 2015, the inland fish-farming sector was producing nowhere near its potential. In Tonkolili, the country’s most undernourished district, a dilapidated hatchery and unreliable access to coastal fish supplies leaves the district unequipped to secure Sierra Leone’s central source of animal protein. With 29% of Tonkolili’s children under five years old stunted, and 22% of the population undernourished, scaling up fish production will boost food and nutrition security as well as increase livelihood opportunities. Previously, fish farmers could access supplies from the Makali hatchery, initially a project of the United States Peace Corps in the late 1970s. But during Sierra Leone’s decade-long civil war (1991-2002), the Makali hatchery, along with many fish farming enterprises, collapsed. Most people in the inland Tonkolili district were forced to rely on an unreliable supply of marine fish from the coast. A revitalized hatchery is integral to increasing fish production in Sierra Leone. Therefore, WorldFish focused on the Makali hatchery as a priority, and within three months had transformed the site into a cornerstone for aquaculture in the district. Now, with a consistent supply of fry and fingerlings from Makali, aspiring fish farmers can access the foundational supplies for a fish pond. 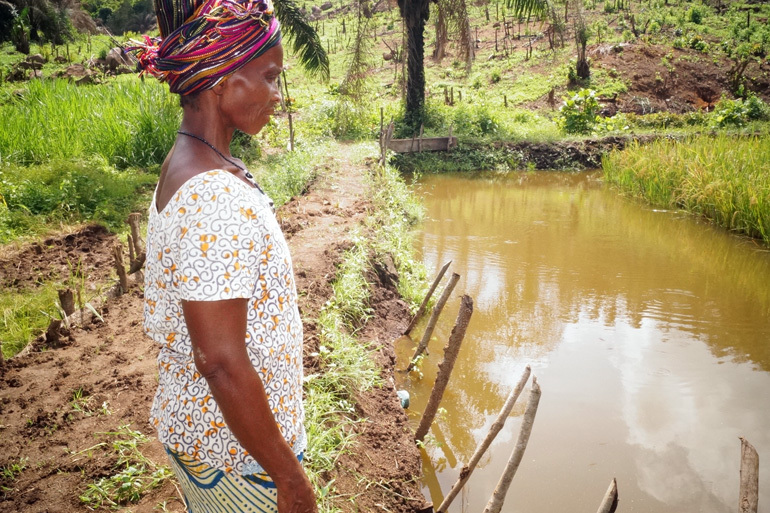 A project beneficiary surveying a project pond in Nokobar community, Sierra Leone. Photo by Monica Pasqualino. Over the past few decades, other aquaculture programs have been introduced in the district but none have proven sustainable. 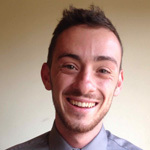 From this learning, WorldFish will build upon prior work while ensuring success through a technically sound, market-driven approach that will sustain beyond the project’s end. With a newly-hired staff of farmers and researchers, the hatchery serves as a link between aquaculture training and research. The project continues to support the efforts of local professionals by hiring staff members who have studied aquaculture and agriculture at Njala University—a university whose construction was supported by USAID in the 1960s and serves as Sierra Leone’s main agricultural university. “It was impressive how Makali was transformed into a functioning hatchery with working staff. This is vital for rebuilding the fisheries sector in Tonkolili,” said Francois Rajts, Aquaculture Consultant for the project. In Tonkolili, yields from small-scale aquaculture are often low. As part of efforts to boost productivity, WorldFish aquaculture experts used tilapia from the inland West African country of Burkina Faso as the founding population to breed tilapia suited to Sierra Leone’s ecosystem. These fish are now ready to be farmed in ponds throughout the district. To further understand the feasibility of extending inland aquaculture in the region, researchers are using a series of test ponds to determine best farming practices for the Tonkolili Inland Valley Swamp ecosystem that they can then pass on to local communities. Knowledge sharing occurs through trainings on topics such as the basics of liming and fertilizing, and producing fish feed made with local ingredients such as cassava. The Makali hatchery is evolving to be a source of technical assistance and education. The hatchery also has the potential to form public-private partnerships, where potential investors can foster a commercial element to community fish production. By involving private sector stakeholders in the management of the hatchery, a business-oriented approach can ensure the hatchery’s long-term success. Increasing the commercial viability of Makali goes hand-in-hand with the WorldFish approach of supporting the shift from aid-oriented programs to long-term sustainable development. At the community level, farmers can purchase aquaculture inputs through WorldFish-supported microfinance and village savings projects—further ensuring the sustainability of this inland fisheries sector long after the project is over. Revitalizing Makali was the first major step in a longer-term project. 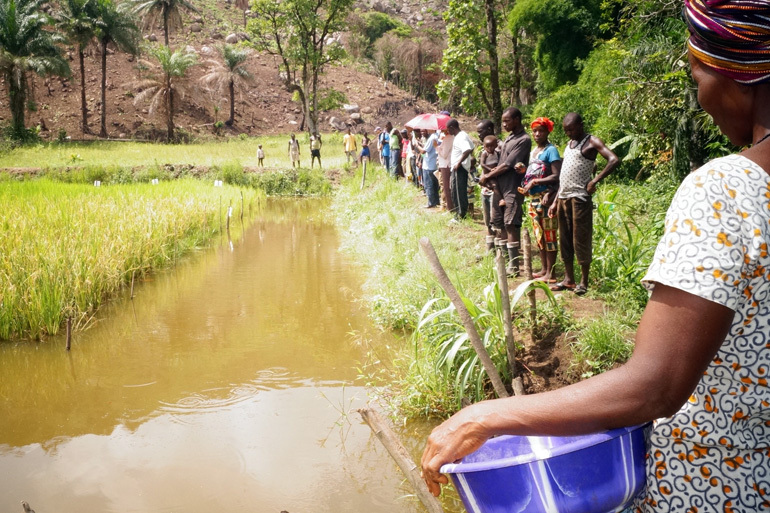 Now, WorldFish is working with some of Sierra Leone’s most undernourished communities to ensure the resources Makali provides are harnessed by communities that are educated and equipped to use fish farming as a path to increased nutrition, income and quality of life.